Although the two main ingredients in this fish recipe (rich, sweet salmon and crunchy, mild cucumbers) may seem to be an unlikely pairing, they actually go together quite well. 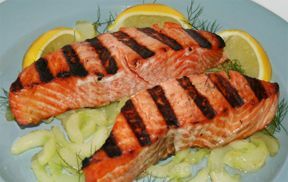 Note: If grilling the cucumbers and salmon at the same time seems daunting, do the cucumbers first and then set aside. Preheat the grill, and make sure the grill grates are very clean. Peel the cucumber and slice it in half lengthwise. Run a spoon down the center of each slice to remove most of the seeds; then slice crosswise about 1/4" thick. Generously brush the fillets with oil, salt and pepper lightly, and place on the grill over direct medium heat. Melt the butter in a large skillet and add the cucumber slices. Salt lightly. Cook, stirring frequently, until tender but still crunchy (3 - 4 minutes). Turn the fillets after 5 minutes. Check for doneness 3 minutes after turning (center should be opaque). The total cooking time will depend on the thickness of the fillets and the temperature of the grill; plan for 10 minutes for fillets one-inch thick. Don't overcook or the fish will become dry. To serve, spread the cucumbers on a serving dish or divide between individual plates. Place the fish on top with lemon slices alongside. Delicious with a chilled sauvignon blanc.